I just returned from my last harvest of wild grape leaves. They are getting a little tough looking, although I found some good ones in shady areas. We are in zone 5a, so I presume here or in colder zones, the leaves are still good for picking and preserving. Otherwise, you might find preserved ones in some specialty markets. 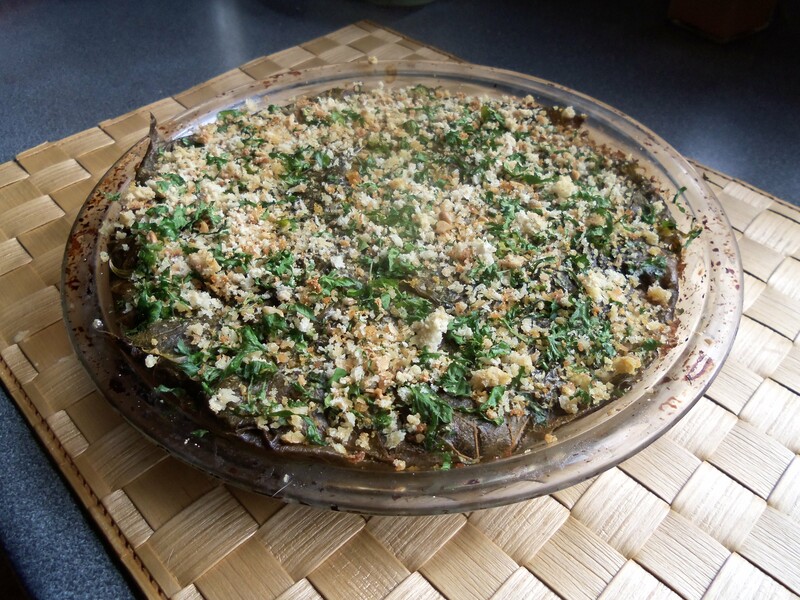 This recipe for grape leaf pie is one of the best reasons I know for collecting and using grape leaves. I have copied it from Yotam Ottolenghi’s book Plenty, and though I have tried to make a different version using more of my own local ingredients, his original remains my favourite. Actually, he found it in an old book called Classic Turkish Cookery by Ghillie Basan, published in 1995. The combination of grape leaves with dill, mint, lemon and yogurt give it a true Mediterranean flavour even with most of the ingredients coming from local sources.The only variations I made was to add a little lemon zest and parsley to the breadcrumb topping, walnuts instead of pine nuts (because that’s what I had) and chestnut flour instead of rice flour for no particular reason. Preheat the oven to 375 F. Place the grape leaves in a shallow bowl, cover with boiling water and leave for 10 minutes. Then remove the leaves from the water and dry them well with a tea towel. Use scissors to trim off and discard the bit of hard stalk at the base of each leaf. Saute the shallots in 1 tablespoon of the oil for about 8 minutes, or until light brown, Leave to cool down. Categories: edible weeds, garden vegetable, Uncategorized | Tags: appetizer, foraging, gluten free, grape leaf pie, grape leaves, local, lunch, recipe, Yotam Ottolenghi | Permalink. Excellent recipe, Hilda! I’m a fan of both Ottolenghi (especially when it comes to vegetables) and Basan. Looking at your pie made me miss my grapevine (dead) even more. But I’ve found out the little seedling growing under my pines is in fact wild grape, so I might be digging it out to plant someplace else in the Fall. Good luck with your vine. Hope you enjoy the recipe as much as I do.